Now the construction of road, railway and expressway is developing gradually. 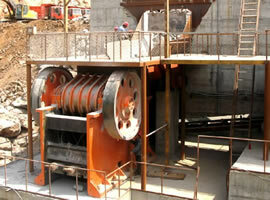 But the development in these fields cannot leave the use of crusher equipment. What kind of crusher can be said the best road and bridge construction equipment? Our engineers find that based on a lot of practices, the construction cone crusher is more suitable for these areas. The engineers say that construction cone crusher not only has a variety of models, but also has strong productivity. 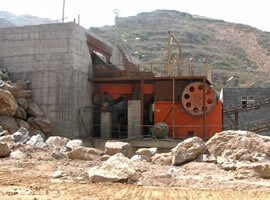 Construction cone crusher is able to meet the huge demand for building raw materials in road and bridge construction. At present, cone type crusher is mainly divided into hydraulic cone crusher, compound cone crusher, high efficiency cone crusher, Symons con crusher and spring cone crusher. PYB cone crusher is the model frequently used in mining industry and road engineering. Our construction cone crusher has strong performance. The feeding granularity varies from 35mm to 300mm and the capacity is within the range of 10t/h to 800t/h. Construction cone crusher has a miraculous effect in crushing iron ore, marble, granite, limestone, limestone and cobblestone. FTM construction cone crusher is developed by new design idea and crushing concept, capable of meeting different specifications of crushing and totally conforming to the principle of more crushing and less grinding. Construction cone crusher has many properties of large crushing ratio, uniform particle size and low power consumption. In addition, it has no special requirements on moisture content. Construction cone crusher is appropriate for crushing all kinds of hard and super-hard materials, as well as hard mineral ores. Construction cone crusher has a miraculous effect on mineral crushing, which gives it a favorable application prospect in the mineral processing field.